It’s been one year since 22-year-old unarmed African American and father Stephon Clark was shot and killed by Sacramento police in his grandparents’ backyard. As his family, friends, and members of the community prepared for a “legacy weekend,” their grief and outrage have risen back to the surface. The Sacramento County district attorney recently announced that no criminal charges would be filed against Sacramento police officers Terrence Mercadal and Jared Robinet who hit Clark with 8 of the 20 bullets they fired, most of which were in his back. This decision was sustained by California Attorney General Xavier Becerra after his office’s own independent investigation. While these decisions surprised no one, they still sparked protests across Sacramento including student walkouts at local high schools and colleges, an occupation of a local mall as a means to communicate with the public, ongoing demonstrations at a Sacramento police station and the Sacramento city council, and a protest in one of Sacramento’s wealthiest neighborhoods. During this march, police clamped down hard, arresting 84 people, including two journalists. Medical students, doctors, and staff at University of California Davis Medical Center, Sacramento’s premiere hospital, staged a die-in on campus for 12 minutes, one for each month Stephon Clark’s family has not seen justice. Adding to the sting of this denial of justice, DA Anne Marie Schubert made public details of Clark’s toxicology and recent text messages in an attempt to paint a picture of Clark as a criminal. At the time of his killing, Clark was being pursued on suspicion of vandalizing cars. But even if Stephon was breaking windows, how does this justify the cops firing 20 shots while he was running away because they thought he had a gun? This escalation to violence is abhorrent and at the very least manslaughter. The refusal to file charges against the officers is nothing new, nor is the tactic of criminalizing the victim. Racist profiling and excessive force continue to be used by police forces across the country. Time and again, activists and community members have responded by taking the streets and disrupting business-as-usual, blocking freeways, and shutting down an NBA basketball game after the police killed Clark. These actions express the outrage at the failure to hold officers accountable and shine a light on the question of who the police are there to protect and serve. California law is the side of the police in these cases as it allows for the use of lethal force when a “reasonably perceived threat” to safety can be argued. Following Clark’s death last year, a state bill was introduced that would have raised the bar for lethal force. Stricter standards would have led to greater accountability as use of force would only be legal when faced with imminent threat of death or serious bodily injury. However, California Democrats, who control a supermajority in the state legislature as well as the governorship, failed to pass this under pressure from the police unions. A new similar bill has been introduced this year. AB 392 would require officers to attempt de-escalation and exhaust all alternatives before firing a deadly weapon. The bill would essentially make it easier to prosecute officers who use unnecessary deadly force. Stephon Clark’s family and activist groups are calling for support for AB 392. Many are putting pressure on powerful California Democrats such as AG Becerra, Governor Gavin Newsom, and presidential hopeful Senator Kamala Harris to take a position. Governor Newsom was elected last year as a progressive with the support of progressive unions in the state like the California Labor Federation and the SEIU. Importantly, he has imposed a moratorium on the use of the death penalty. Given their history of failing to pass similar legislation, California Democrats are unlikely to pass AB 392 without pressure from the public. We need a mass movement to demand an end to police brutality and to hold cops accountable. 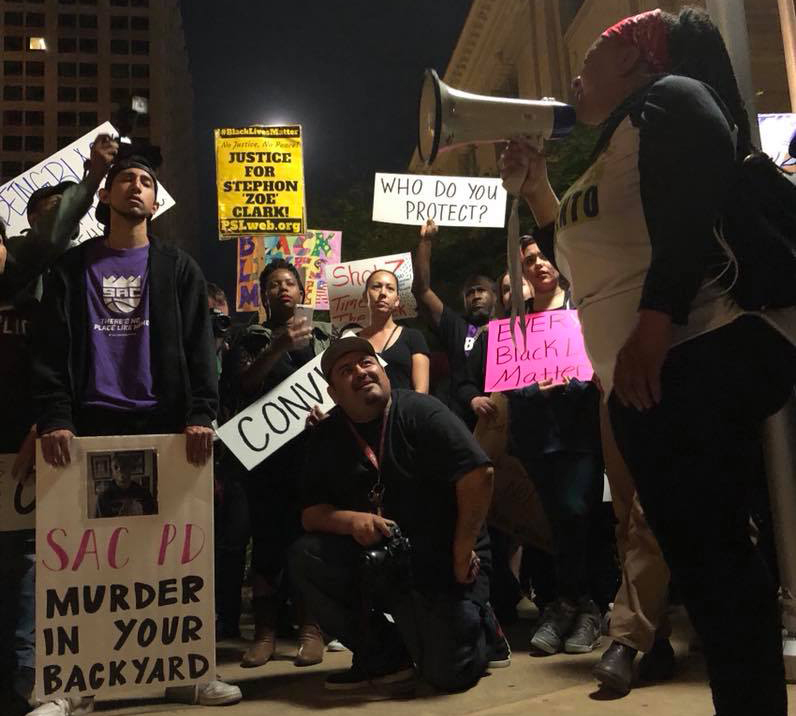 The Black Lives Matter movement in Sacramento and its national presence in the streets since the killing of Michael Brown in Ferguson, Missouri in 2014 has pressured lawmakers into passing some reforms. A larger, wider movement is needed to stop police using deadly force, especially against black people. Recently, the BLM movement scored a victory in Chicago with the conviction of police officer Jason Van Dyke who killed 17-year-old Laquan McDonald in 2014. This rare conviction of a police officer can be credited to BLM and the movement on the streets. Despite the short sentence of six years, this conviction is a victory and proof that organized movements of activists and community members can work. The unions, community organizations, and people of California must get behind the campaign for justice for Stephon Clark. Uniting working people across race and ethnicity, to demand an end all police brutality is a critical step to building the movement to end the inequality and violence that capitalism represents. Immediate firing of the officers involved. Support AB 392 and call for further laws requiring mental health professionals be present for de-escalation. For a public independent investigation of Stephon Clark’s killing by community, Black Lives Matter, and labor organizations with full and immediate access to all evidence. For an elected civilian board with full powers over law enforcement.